September 12, 1969. 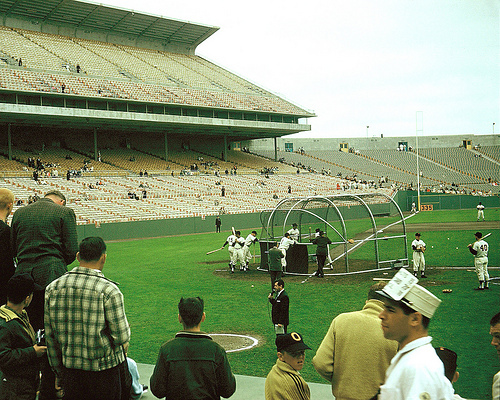 Sat behind the plate with my pop and best friend M. Boyd and watched Juan Marichal hurl a one-hitter against the Cincinnati Reds. The only hit was a third inning Tommy Helms single that went just under the outstretched glove of Ron Hunt. You remember Ron Hunt. The Mets bonus baby who seemed every year to have the distinction – at least when he was with the Giants – of being the player who was most often hit by a pitch, including a mind boggling 51 times in 1971. Anyway, back to that 69 Marichal game, many years later I read where Marichal referred to that as his greatest game ever. But, boy, has the game changed since then. Forty years later if you want to sit behind the plate at a Giants game it will cost you $ 73.00. And that is just for the ticket. If you wanted a cup of hot chocolate in the 7th inning because of the Artic conditions at Candlestick Park in 1970 it cost you $ 0.25. Now it is gourmet brewed hot cocoa at $ 5.00 a cup. What was once a simple pastime, affordable to everyone, has now become a hyper-marketed entertainment smorgasbord targeted solely at America’s youth. The Sports Purist comments on all that is wrong with sports today compared to sports of an earlier era, mostly baseball, but also other sports as the season or moment dictates. The purpose is to relive the memories and to illustrate that change, though inevitable, is not always good. Read on and Prosper !